In considering future research endeavors, I find myself coming back to the topic of Albert R. Parsons, an activist and newspaper editor best known for being one of the five “Haymarket martyrs” executed by the state of Illinois in 1887 for their supposed role in the aftermath of the famed labor demonstration. For those not familiar with his life, here is a brief overview. Parsons was born in 1848 in Alabama, raised near Tyler, Texas, and in the Texas Hill Country, and, as a child, worked (against his will) as an apprentice at the Galveston Daily News, learning a printer’s trade. With the outbreak of war in 1861, Parsons, at only 13, volunteered in a Confederate guerilla unit in Texas and later served in both artillery and cavalry outfits in the regular Confederate States army. After the war Parsons attended Waco (now Baylor) University, became a Republican, and opened his own newspaper, the Waco Spectator. Through his publication he supported Congressional Reconstruction measures, including voting rights for former slaves, and espoused an emancipationist memory of the war, which he referred to as “the slaveholder’s rebellion.” Parsons was forced to close his newspaper in the late 1860s, working variously for the state of Texas and the federal government. Controversially, Parsons married biracial Lucy Ella Gonzales (who went on to become a feminist, labor activist, and one of the founders of the Industrial Workers of the World) in 1872 and moved to Chicago the next year. Chicago proved a more suitable milieu for Parsons’s politics, and the city’s political scene in turn fostered his still-forming radicalism. He became a correspondent for the Chicago Times, worked for aid societies, and, believing there to be strong parallels between Chicago’s urban poor and dispossessed blacks and whites in his native South, he became a socialist in 1875 and was active in union politics with both the dying National Labor Union and the emerging Knights of Labor. He ran for various local and national offices, including United States Congress, on the Workingman’s Party ticket. He backed the railroad strikers in 1877, championed the 8-hour workday, and was instrumental in May Day marches and strikes in Chicago and elsewhere. Growing disenchanted with the corruption he saw as inherent to the mainstream political process, Parsons abandoned democratic socialism for anarchism in the 1880s, and opened his own anarchist newspaper, The Alarm. Endorsing a national walkout in support of the 8-hour work day and protesting violent police intervention against the striking workers of the McCormick Reaper Works, Parsons spoke at a peaceful demonstration at Haymarket Square on May 4 with Chicago mayor Carter Harrison looking on. After Parsons left police entered the square, an unidentified person threw a bomb, killing one policeman, and the police opened fire, killing 7 demonstrators. The rest, as they say, is history, as Parsons and seven other anarchist leaders were arrested, essentially for promoting dangerous ideas, and charged with the bombing, even though none of them had in fact thrown the bomb and Parsons himself was not even in attendance when the incident occurred. Parsons could have had his death sentence commuted to life in prison, but he refused to admit his own guilt. In the end, four of Chicago’s anarchist leaders were executed (one committed suicide), including Parsons. 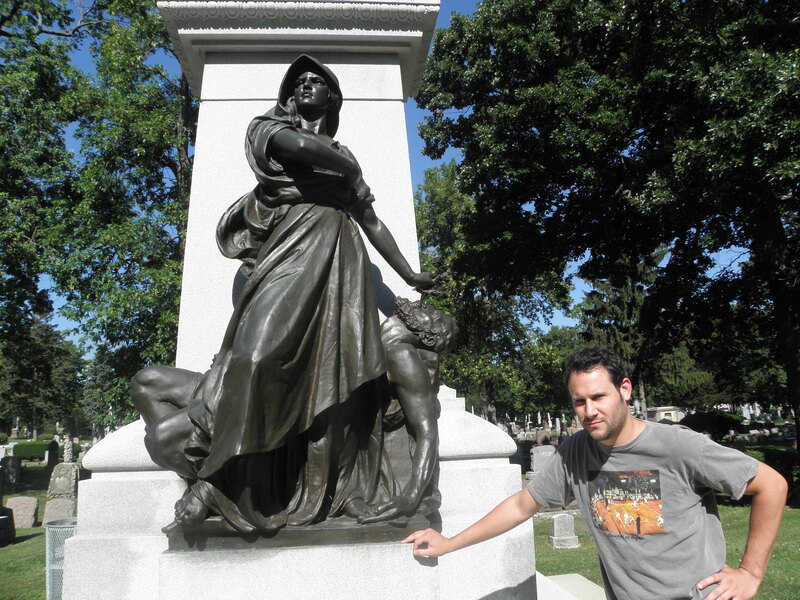 Haymarket is one of my favorite episodes in American history to teach and is always one of the more dramatic moments in my classroom, but I never seriously considered any aspect of it a possible research project for myself until a visit to the Haymarket Martyrs Monument in Chicago’s Forest Home Cemetery last summer. The thematic crossroads between class, gender, race, and section in Parsons’s story and class radicalism as an outgrowth of racial radicalism are too rich not to consider and should be told and re-framed in the context of recent historical scholarship and theory, or so I thought. I am also intrigued by a broader study of the Haymarket affair in American memory, as the Haymarket Martyr’s Monument and Forest Home Cemetery itself has become iconic, hallowed ground for generations of American radicals. To that end, my second aim of this post is an admittedly selfish one. Aside from imparting a bit of knowledge on Parsons himself, I am interested to know what you all think of such a potential research project on his life and how best to approach it. My current work deals with the interplay between sectionalism and regionalism in the Civil War Era Ohio Valley and how the Ohio River itself came to be an imagined sectional partition. So, Parsons is, in some ways, just another – if atypical – border crosser whose life bridged several major themes in nineteenth-century American history, mirroring the national transition from civil war over race and section to civil war over class, labor, and industry. The only Parsons biographies are the one written by Parsons himself and published after his death in 1889 and Alan Calmer’s 1937 work, Labor Agitator: The Story of Albert R. Parsons. So although broader works on Haymarket or American labor radicalism have dealt with Parsons, this is relatively fertile ground for publishing. The question becomes how best to envision this hypothetical project. As a type of microhistory? As a sort of cultural biography that deal as much with the complex and contradictory themes surrounding Parsons’s life as it does the details of his life? Or, assuming the source material cooperates, as a more traditional biography? Of course the answers to these questions will determined largely by where the sources take me. Again, I’m just prodding for ideas at this point, but I thought Emerging Civil War readers might be interested to know a bit more about such a transfixing life. For further reading on Parsons I recommend his posthumously published autobiography, Life of Albert R. Parsons: With a Brief History of the Labor Movement in America, which is available on Google books, or one of the several works on Haymarket, most recently by James R. Green and Timothy Messer-Kruse. “Big Trouble” by Anthony Lukas was interesting covered the region of minning labor..
something of that sort would certainly provide interesting information if the sources were available for research……. I think you ought to just jump in & write what you love. It will find its own place. I hope you think this is as funny as I did. Of course, I teach AP Math. Thanks for the recommendation, Sharryn. I’ll give it a look. Meg: That seems like the logical progression! Vampire killer maybe? Let’s leave the vampire killing to President Lincoln . . . Please write this. I’d love to know how a Confederate vet turns into an anarchist and winds up at Haymarket. I’ve studied both CW history and the history of anarchism in the labor movement, but never really saw connections such as this (apart from General Hancock breaking up a railroad workers strike). I second the recommendation of Green’s absorbing, well-researched book on the Haymarket affair. I read ‘Death in the Haymarket’ by James Green, which is a great book on the subject. What a travesty of justice the entire affair was, Im a history teacher and always include this in my classes. Where are the Parsons today?